Nitrocarburising differs from Nitriding surface engineering simply by the addition of the element Carbon (from a suitable carbon containing gas such as Endogas) during the process. The compound layer formed is generally thicker, more corrosion resistant and often takes the form of Epsilon Iron Nitride. Nitrocarburising is more commonly applied to low allow steels, mild steels and cast irons, but can equally be applied to any steel which is thermally stable at the treatment temperatures. Among other surface engineering technologies we use, one special Nitrocarburising treatment Hauck HT provide is the Nitrotec® process from its site in Birmingham. This is a Nitrocarburising plus oxidation treatment to provide superb surface properties to medium carbon steels. Detailed information on Nitrotec® Is found under the treatments section. Hauck Heat Treatment plants in Luton, Letchworth and Blackburn offer the Nitemper process which is carried out in a sealed quench furnace. Short treatment times at around 570°C followed by oil quenching enhances both surface and core properties of most steels. Nitemper is an excellent process providing an increase in surface hardness and wear resistance to steels at low cost. The Tufftride® salt bath process also falls under the banner of Nitrocarburising. There are many different methods of Nitrocarburising, each offering advantages and benefits over the others. To choose the optimum treatment in terms of properties, and cost for your application please call Hauck HT or advice. Gas Nitriding is surface engineering, and delivers a process which hardens many materials such as alloy steel, Nitriding steel, nickel alloy. The GAs Nitriding process can produce a compound hard layer on the component. Gas Nitriding has been used industrially since the early 1920's. The heat treatment process is carried out in a sealed retort furnace at temperatures between 490°C and 530°C in a flowing Ammonia atmosphere for times up to 120 hours. Hauck HT offers extensive Gas Nitriding capacity from Telford and Letchworth with 20 Carburizing furnaces of various sizes. The largest capacity is at Telford where furnaces are capable of processing parts up to 4.4m high and 1.2m diameter. 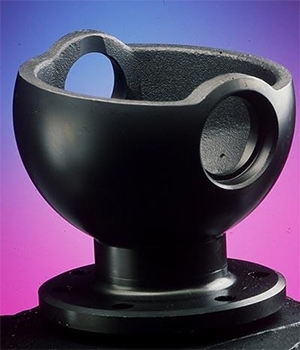 Gas Nitriding is normally carried out on hardened and tempered and fully stabilised parts to produce a hard wear resistant case, enhanced corrosion resistance and good fatigue performance. Our surface engineering technology knowledge has been engaged, resulting in the process improves wear resistance in alloy steel, nickel alloys and other metals. The process is usually performed on fully finished components which, in many instances, require no additional operations prior to assembly. Commonly this is referred to as hardening and tempering of steels or alloys. Whilst Gas Nitriding is normally applied to low alloy steels it is possible to nitride other materials such as stainless steel, titanium and nickel alloys, however the preferred nitriding route for those materials is Plasma Nitriding.